I know you probably work five days a week which only leaves the weekend for you to work with your horse. On the weekends you may get a little bit of time in with your horse, but I also know that if you have children or grandchildren you want to spend time with them too. If you don’t have children you’re probably spending time doing things with your husband. I hear you loud and clear! 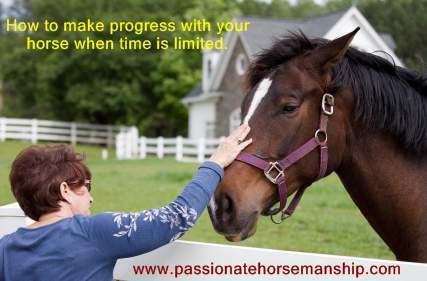 There was a time when I felt I couldn’t make noticeable progress with my horses because of my limited time. Even though I no longer have small children at home, I do have eleven horses that I train and I’m working on building my business as well as helping my husband build his business. I know you feel like you are unable to make any progress with your horse when you can only work with them on the weekends. With the Passionate Horsemanship training methods, I’m here to tell you that you can make progress with your horse in ten minutes a day using clicker training. Clicker training is a powerful and very effective communication tool. If you can’t do ten minutes a day you will still get results working with them three or four days in a row which is better than one day here and one day there. Since you have to feed your horse everyday plan on taking ten minutes to work with them before you feed them. With clicker training, you can teach your horse to back, move their fore and hindquarters, side-pass, get them used to the clippers, flex, lunge, neck rein, stand for mounting, trailer loading, gain confidence around spooky objects and so much more. If you have to lead your horse from the stall to the pasture work on their backing, side-passing leading on a loose lead, moving their forequarters or touching different objects. By doing this you will be amazed at the difference it will make in your horse. Everything you do on the ground transfers to when you get on their back, and it will improve your horse’s performance when riding. If you would like to know how to use clicker training with your horse to get outstanding results Contact me today and lets set up your lesson. Not close enough to take lessons no problem I offer an online course where you can learn from the privacy of your own home. Great suggestions, Kim. So many horse owners forget that they are training their horses every moment they are with them. 10 minute training opportunities are always do-able. Not only in the winter when the weather is poor and the day light is limited, but also in the extreme hot weather of summer. Even hand grazing can be a 10 minute training if the owner remembers to maintain her personal space boundaries.